Lin McCarthy as Charley Burn in The Surveyors. He's the one who help Len rob the bank. 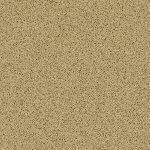 He served in the military during World War II and used the G.I. bill to study acting at Geller's Theater Workshop in Los Angeles. 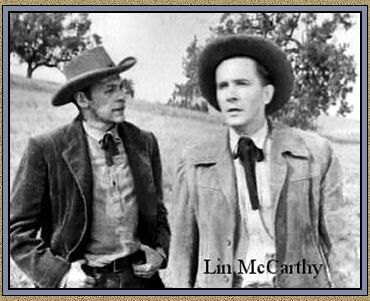 Lin McCarthy was a character actor on stage, television and film for three decades. His had his first starring role in Horton Foote's play The Chase on Broadway in 1952. 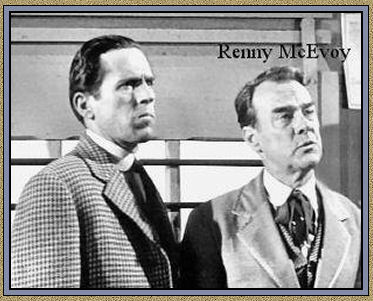 McCarthy had roles in 1950s dramatic television series including Studio One ― Goodyear Television Playhouse ― Philco Television Playhouse, Robert Montgomery Presents ― Armstrong Circle Theatre ― Kraft Television Theatre. Later television appearances included guest roles on popular series such as Quincy ― The Fugitive ― The F.B.I. ― Baretta ― Lou Grant ― Knight Rider ― The Blue Knight and a recurring role in the 1957 - 1958 TV Series Modern Romances. He did several miniseries: The Winds of War in 1983 and television movies including Tail Gunner Joe in 1977 and Eleanor, First Lady of the World in 1982. On the big screen, McCarthy played Capt. Anderson to Jack Webb's sergeant in The D.I. about Marine boot camp in 1957. He also was in the 1950s films Yellowneck and Face of a Fugitive. McCarthy retired from acting in 1988. Frank McClure as a spectator in the courtroom The Photographer. Frank's career spans over thirty years and over two hundred credits to his name. 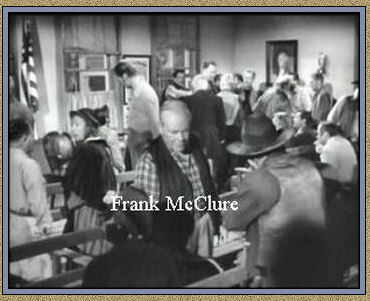 Frank made his first appearance in 1926 movie The Whole Town's Talking as a Hotel Desk Clerk. He appeared in mostly movies such as Citizen Kane (1941) ― Some Like It Hot (1959) ― Auntie Mame (1958) ― Around the World in Eighty Days (1956) ― Because You're Mine (1952) ― Calamity Jane (1953) ― Easter Parade (1948) ― Mr. Smith Goes to Washington (1939) . Besides The Rifleman (1959) he has appeared in Perry Mason (1958) ― Superman and the Mole-Men (1951). He also appeared with Chuck in Trouble Along the Way (1953) as a Priest. 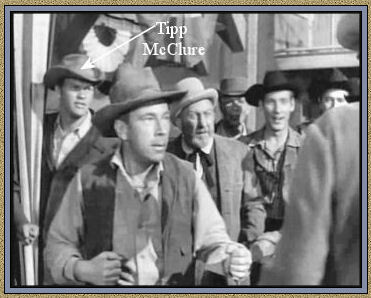 Tipp McClure as a Townsman in The Fourflushers. Tipp started out by doing extra work. His career spanned twenty years with twenty-eight credits to his name. He first appeared in the movie Friendly Persuasion (1956) as a Union Soldier. Rattlers (1976) ― Son of Flubber ― (1963) Hell Is for Heroes G.I. ― (1962) Blues (1960) ― The Great Impostor (1961) ― The Rat Race (1960) ― Don't Give Up the Ship (1959) ― Some Like It Hot (1959) ― Daddy-O (1958). Besides The Rifleman (1960) he has appeared in numerous TV Series such as This Is the Life ( 1974) ― That Girl (1970) ― The Twilight Zone (1963) ― Saints and Sinners (1963) ― Target: The Corruptors (1961) ― Cheyenne (1961) ― Cain's Hundred (1961) ― Bronco (1961) The Deputy ― (1961) Maverick ― (1960) Michael Shayne ― (1960) Bat Masterson ― (1960) Tombstone Territory (1960) ― The Many Loves of Dobie Gillis (1960) ― This Man Dawson (1960) ― Alfred Hitchcock Presents (1958) ― Official Detective (1957). Renny McEvoy as Burke in The Grasshopper. Appeared in films like Wings for the Eagle (1942) ― The Story of Dr. Wassell (1944) ― Wing and A Prayer (1944) ― North to Alaska (1960) and TV Series such as Dragnet ― Adventures of Superman ― Topper ― Broken Arrow ― The Donna Reed Show ― Perry Mason ― The Loretta Young Show ― The Jack Benny Program ― Bonanza ― The Big Valley ― Bracken's World —Cimarron Strip — The Iron Horse — Bonanza — Richard Diamond, Private Detective — Wanted: Dead or Alive — Wagon Train — Tales of Wells Fargo — Broken Arrow. He never liked for him or anybody else to say, "good-bye"; it was always, "so-long" because he thought "good-bye" was permanent like he was never going to see you again.